The Living House offers an Intervention Service through our professional intervention team which includes a qualified Close Protection Officer, Intermediate Life Support Paramedic, and registered Drug Addictions Counsellor and Trauma Therapist. We specialise in all types of interventions through careful risk assessments of each case and extensive pre-and post-intervention planning. Our objective is to help create a space where family & friends of the addict have the opportunity to tell the addict the affects their using has on them. This process, with a touch of tenacity & perseverance on behalf of the intervention team, serves to break down the addict’s denial and presents an opportunity for the intervention team to transfer the addict/alcoholic to a suitable rehabilitation facility according to the addict’s core dysfunctional behaviours. The cost of an Intervention is based on a 6 hour rate of R8000,00 which is all inclusive. Intervention is a word frequently used by people, but they’re unsure of what it really is, or what happens in an intervention. The following is some information that defines “what is an intervention,” and also outlines what happens in an intervention. An intervention is something that involves intervening in the life or behaviour of a person, in the hopes of changing their behaviour or the outcome of the situation at hand. An intervention is often something that happens when the loved ones of an addict see their life spiralling out of control, and they want to do something to help them, and they want to also end their own enabling. In many cases, an intervention may also include an ultimatum presented to the addict, and in some cases, an intervention might include a professional who works with the group. What happens in an intervention is that a group of people come together and in a sense, confront the person who is addicted. They work to persuade them to not just make changes in their life, but more specifically, to seek help from a rehab centre to deal with their substance abuse. 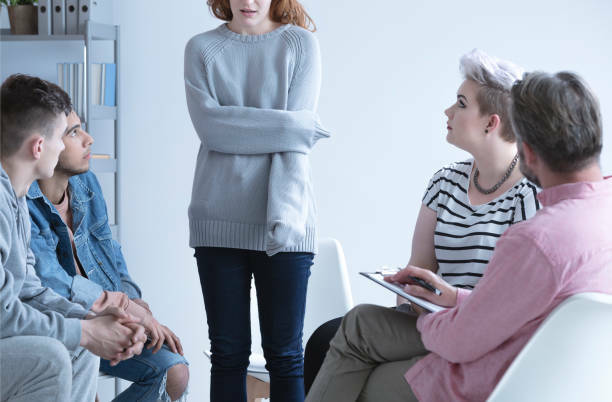 A group that does an intervention usually includes very close friends and family of the person with an addiction, or it can even include colleagues in some cases. It is important that the goals and consequences of the intervention are discussed, understood & agreed upon by everyone involved prior to the actual intervention itself. Interventions generally have a leader who is selected by the rest of the group. The group, when they initially meet, discusses what they know about the person’s addiction, it is often suggested they write down a list or letter or maybe several letters to be read that will highlight how the addiction individually affects each of the people. They will show how addiction has affected the addict’s own life as well, and they will then let the person know that it’s their wish that he or she go to treatment. There are also consequences outlined as to what will happen if the person doesn’t go to treatment, and they will define the outcomes if the person doesn’t agree to treatment. It is of paramount importance that the consequences the addict will bear, should they decide to not accept treatment, are clear to everyone and that everyone is onboard. Interventions are generally highly emotionally charged and when it comes down to it no one must falter from their commitment to follow through with the decided upon consequences. In most cases, what happens in an intervention is that the group tries to find a reason to get the addict to a specific place at a certain time, and the objective is usually to catch the addict off guard, to allow for more honesty and vulnerability from the addict. Then, once the addict arrives at the agreed-upon location, everyone is present in one room. The addict is asked to have a seat, everyone reads a letter or shares their thoughts. So how does an intervention work? What is it about an intervention that tends to be effective for addicts? The goal of an intervention is to motivate an addict toward treatment. There is some research showing addicts are more likely to seek treatment when an intervention is what ultimately pushes them toward going, although they don’t necessarily affect how well the treatment itself works. Answering “how does an intervention work” is really about understanding that it’s a way to show an addict just how profound their substance abuse is in the ways that it affects the people around them. Also, important in answering “how does an intervention work” is the fact that if an addict does agree to treatment, they need to go as quickly as possible after the intervention itself. If an addict doesn’t agree to treatment, following an intervention, then they must face the consequences outlined by their friends and family during the meeting. Some general things to consider about how drug intervention works includes the fact that it should be conducted by someone with experience, who can mitigate defensive reactions on the part of all participants. What a lot of people don’t realize is how emotionally charged interventions can become because of all the intricate personal relationships at play and a professional drug intervention specialist is detached from these personal relationships, which can be incredibly helpful. It’s also important to note that during an intervention the addict will not only be defensive, but may minimize their problem or their behaviour, may try to guilt their loved ones, or they may start to present themselves as a victim. In fact, both denial and victimhood are two of the primary obstacles to a successful intervention, and professional interventionists are specifically trained to address these areas.